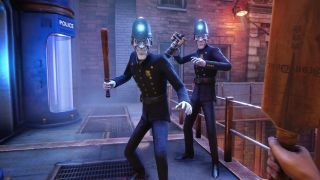 In anticipation of its launch next month, Compulsion Games has released a lengthy new trailer for We Happy Few, which provides more details on its newly designed structure. The video, which is difficult to follow thanks to its kooky narration and choppy editing, introduces the three playable characters who form the backbone of the game’s story. Players will start out as Arthur Hastings, who plans to escape the city of Wellington Wells into the slum-like “Garden district” in search of his missing brother. Later on, you’ll assume the role of Sally Boyle, an “experimental chemist” who can use her concoctions against the city’s oppressive police force. Last up is Ollie Starkey, a Scottish former soldier reminiscent of Groundskeeper Willie having a particularly bad day. The three characters are clearly built around different play-styles, with Ollie favouring aggression and Sally emphasising stealth, while Arthur sits somewhere in between. The second half of the video demonstrates the various systems at play, such as weapon-crafting, stealth, character upgrades, and side missions. There’s plentiful footage of the game’s pugilistic melee combat, and a neat clip where the player vomits butterflies. All-told, the trailer suggests We Happy Few is now far more closely aligned with a game like BioShock than it was during its Early Access period, something which James Davenport discovered earlier this year. Although the striking style and subversive tone suggested a story-driven experience, the game originally played out as a procedural survival sim. In the last year or so, however, the developers have significantly changed the game’s direction, introducing a far stronger narrative thread revolving around the three characters shown off in the trailer. Either way, there’s certainly plenty to be intrigued about, from how the world-state will change when players ingest “Joy”—the drug used to control the populace through a constant state of euphoria, to the rictus-grin doctors who remind me of Timothy Dalton as the shopkeeper in Hot Fuzz. We happy Few launches on August 10. The trailer is below. Make sure to pay attention.